The Joy of the Gospel – Evangelii Gaudium! Francis Pope wrote his first apostolic exhortation Evangelii Gaudium! Next Sunday, 24th November, the day of closing the Year of Faith will hold a ‘Joyful’ moment. 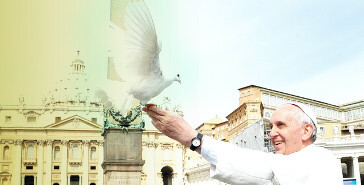 Papa Francis will deliver the Apostolic Exhortation “Evangelii Gaudium”. This is Papa’s first official document after the encyclical “Lumen Fidei” (The light of faith) which he co-wrote with Papa Emeritus Benedict XVI. In his Exhortation, the Pope entrusts every baptised Catholic with the mission of becoming an evangeliser. The Church is emphasizing on her mission and if you closely watch, the word ‘mission’ is booming in church. A missionary boom is imminent. The missionary boats started sailing and are you in the same boat? Do not die like my secular friends, evangelise someone somewhere before you die. I pray let this be a wake-up call for all sleepy, Catholics in maintenance mode.